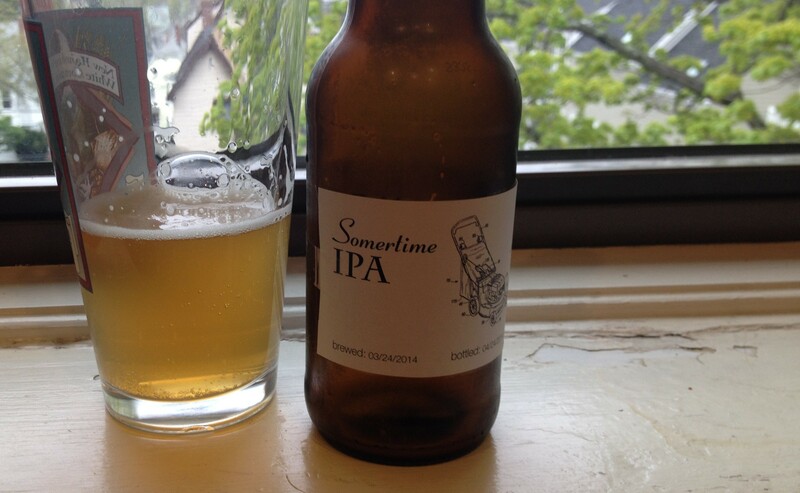 Batch #16 – Somertime ipa | Because beer. 30 minute boil. Substitutions: Zythos for Centennial, Falconer’s Flight for Amarillo. No ice used to cool. Sink water was filled up and left to sit while we bottled the DIPA. Two packets Safale US-05 dry yeast. 6gal carboy. We did not rehydrate the yeast prior to pitching. Fermentation seemed pretty slow to chris, but possibly it was due to the beer having half of the usual fermentables? Labeled with lawnmower somertime labels. The previous batch had a very light carb, so Ross’ stash will be left upstairs where it is warmer until 5/8 to carb up in order to test temp on carb effect. 4/29 (5 days in the bottle) we tasted our first bottle. It was still under carbed (duh) but it had a pretty good, clean flavor. We were both surprised by the bitterness vs fresh hop aroma. There was a significant bitterness to it, and very little floral or citrus notes. This wasn’t dry hopped so I don’t know why were expecting more, but it did surprise us both. Making session beers is a nice way to offer some variety in the pipeline. This will be a great after-work beer, and it won’t send you to bed if consumed in moderation.